Availability: This product is discontinued and no longer available for purchase. For alternatives browse our Badminton Shoes department. The Yonex Power Cushion 75 men’s badminton shoes offer innovative Power Cushion technology that absorbs shocks in an instant and then smoothly reverses the impact energy to transfer it to your next move. These lightweight shoes have a low-cut design and a breathable P.U. leather and polyester mesh upper to keep you fresh while playing. An E.V.A midsole gives you great cushioning and feel, whereas Ergoshape technology provides added stability in the forefoot and toe area of the shoe. The outsole is manufactured from rubber and guarantees improved gripability thanks to a Hexagrip pattern which also reduces the weight of the shoes. Awesome, second pair of 75's I've had. Super comfy. Always by a half size bigger as I have broad feet. Well worth the money. 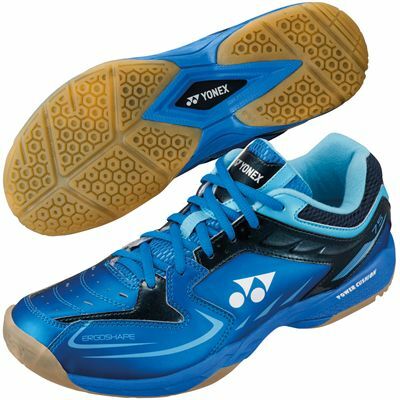 for submitting product review about Yonex Power Cushion 75 Mens Badminton Shoes.